Source: Machinations, manipulations, and all lies. Breaking and dispelling the myth behind that love that has trapped you emotionally to a very destructive and sadistic Narcissist. “You have been working your way up to this day for a very long time and just when you think you are finally ready and determined to leave because you know that you HAVE to get out of this relationship, the Narcissist in your life starts manipulating your emotions and turning them upside down and every which way with guilt, intimidation and even fear tactics! OR on the other end of the spectrum looks you in the eyes and tells you the exact words you have been waiting to hear – “I love you so much, I will do anything to change, and save us or I love you more than life itself!” There it is again that dizzying ride on that Narcissist’s roller coaster and you just can’t get off! You thought you were at the point of ‘enough is enough’ but before you know it the Narcissist has found a way to push your buttons in a manner to hook you back in again. Whether they say they love you or imply that they don’t like you (hate you) because you are everything wrong in this relationship, you are still right there with them and just trying to get it right with them SOMEHOW! The real truth here is the simple fact that this Narcissist has kept you in this conditioned ‘limbo’ for a long time because you serve a function or a need along with many ‘other’ sources (people) that you were not always aware about. They have purposely managed you down to be like this and it is purely control, sadistic and a horrendous betrayal of your love and reality. This Narcissist used that big love bomb or charm to ‘get’ you hooked into their scheme until they no longer could keep the façade up and got what they came for! Bonding or real love is not something they are familiar with or understand within the same realm that we do but they know how to use it as a tool to pull you into their schemes. That charm or love was a decoy so they could tap into your resources or of course use you as supply. Because they don’t know love or bonding that old saying of ‘familiarity breeds contempt’ is written in stone with them – or again they can’t keep up the charade because the monster inside of them lives so close to the surface and always makes its way out. BUT again it serves the purpose until they get you hooked into their agenda! Real caring and love will naturally grow between two normal people that are on the same page, but there never was any sort of growth in this relationship because it was all a terrible hoax, con job, farce or whatever words describes a dysfunctional predator looking for prey to feed it’s many needs! Those words are not very pleasing to see in writing but getting to the real truth will set you into a direction of healing and recovery. Sure it seemed like love but ask yourself right now if you believe that it was the real thing! It was the real thing to YOU, but that is what this Narcissist was counting on and using to keep you connected to them. This is why it is so readily described as a big CON job. The Narcissist will find every way to keep you connected until THEY ARE DONE WITH YOU and not because they care, love you, or anything real that equates to any type of a cohesive relationship. It is a one sided take and take more relationship with them. The Narcissist knows all of your soft or blind spots intimately because she/he has been intensely studying and monitoring and projecting it back onto you so you SEEM to have so much in common. Then they disable your self-esteem and basically control you to stay until they are done with you because you offer a viable source of supply to them. How did they unlock all of that stuff – through that amazing love and through your emotions that made you feel like you could TRUST them. After all a Narcissist is ALWAYS a predator and you are the prey, or the source of Narcissistic supply. The Narcissist loves to know that you are enmeshed in her/his web and will remain there accepting their copious amounts of abuse, and knows exactly how to ensure this just like she/he knew how to trap you into loving them. Once you break free the Narcissist will show you the real monster that resides within and step up their game to try to annihilate your integrity and make you out to be the hideous and sick monster that they really are. After all they are completely entitled to abuse people because in their delusional way of thinking they are always the victim and entitled to whatever they want no matter what they do to get it. Because of the negative conditioning you are basically addicted to trying to fix the wrongs and by doing so you have been conditioned to accept the blame with the very unfortunate consequence of being hooked into the abuse too! No matter how much you logically know you need to get away, every single cell in your body is addicted to the Narcissist in frightening and destructive ways. Their love was ABUSIVE from the very first day you met them and because it was built on a sadistic agenda of lies to pull you into their harem of supply. This is not love and you realistically know this underneath all of the confusion, this is desperate love or a trauma bond that attaches you to this frightening creature that keeps you captivated with their sadistic tricks and games so they can keep you as a source of supply until THEY are done with you. This is a horrendous situation that you NEED to escape from in order to heal from the damage that was inflicted on you. This is not your fault, this is somebody that is an emotional and psychological vampire that needs your attention, admiration, and more than likely some of your material worth as well! Today I can see this so clearly and only wish I had this information available to me at the time, but I didn’t and I fell prey to the psychological manipulation, lies, and isolation that locked me up in this bizarre world with a Narcissist! After the many years of being conditioned and walking on eggshells trying not to upset your Narcissist you have completely lost yourself in all of this manipulation, control, confusion and emotional distress or the basic brain-washing to believe in this person. Each and every day was/is about surviving another day and not upsetting them and trying to get back to what you BELIEVED was a real or a cohesive relationship because of the seductive love bombing and charm that trapped you into this hideous cycle of abuse AND avoiding the pain they inflicted onto and into you. Take a quick look back and ask yourself how many years you have lost being in this cycle of back and forth arguments, blame, lies, and the conditioning that managed you down into a place of desperation? Now ask yourself if any of it has ever been resolved (the crazy arguments from nowhere) or is it the same exact cycle where you end up ALWAYS being blamed, punished, feeling helpless, vulnerable and WORTHLESS? If your Narcissist is gone have they jumped right into another relationship and left you right there with all of the destruction without any sort of closure. Did they try to resolve any aspect of ‘what was wrong’ besides blaming you and possibly bragging about their new and amazing love? How could they move right on after being in such a terrible relationship with us? Here is the REAL truth – you could never please them and it would never get any better with them, nor could you heal them or make them see what they are doing, and they already had their next source of supply lined up – this is what they do in every relationship! If they left you it is because you were too smart for them and saw through their lies and they knew it as well as the fact that you were no longer a viable source of supply! We are just one of many objects to them and NO BIG DEAL because they ALWAYS find a new source of supply – that is their pattern and you will hear this many times over from other targets/victims! What does that say and what does that make us? NOTHING but another person that was objectified by this personality disordered person! YES this is a personality disordered person that does NOT share the same reality as we do. You were manipulated and conditioned into this subservient role! What is their reality —– THIS! They are fundamentally compelled from deep within to deny and conceal all of their deficits or weaknesses through their self-made image. They consistently and habitually redirect any negative thoughts or appraisal of themselves outward, unconsciously believing that in doing so they will forever keep their deepest suspicions about themselves at bay and guarded. Getting anywhere close to confronting their darkness OR their innermost core scares them to death and they will defend their façade with a ferocious attack on anybody that threatens it or questions it. They can NOT face the truth about themselves so they defer to this amazing but FALSE self – but yet they act out in destructive ways that harm good people because the false self can’t even come close to reality so they have to extort (con people) through faked emotions and love until they are satiated. Their emotional resources are nonexistent and their time is completely used up maintaining this façade and supplementing the happiness they lack through fleeting encounters of securing all kinds of supply that includes a 24/7 source. Everyone is objectified to support this amazing Narcissistic façade that is non-existent and lacks real emotions. We are dealing with a facsimile of a person and a gross imitation of life that is meant to fool us in order for them to achieve their self-serving needs. It reminds me of a movie about aliens that landed on our planet and took over the bodies of other human beings so that the aliens could take what they needed from our planet by disguising themselves as one of us. What is basically recognized by the behavioral sciences is that Narcissists totally and fundamentally lack self-insight, and that is putting it lightly! The truth is that they defer to this ‘false self’ by disassociating from their defective real self so that they never come to terms with the grotesque self that they loathe. Consequently they only have access to knowledge that they create (or basically imitate) that supports and becomes their false self and it works for them, but there is no such thing as empathy or emotions in that made up reality of theirs. Somehow they know exactly what they need to make up for the deficit to fit in. That to me is amazing enough proof to say that they DO KNOW RIGHT FROM WRONG because they use what they need to get what they need – as well as the fact that they protect their façade fiercely because they know they are one huge lie. So with all of that in mind, they have to keep the mechanics of it constantly oiled, in motion, and well maintained to avoid stalling out and seeing the defective parts! They accomplish this with blaming, shaming and projecting those ugly parts onto us. Wow that is a whole lot of work to maintain an image – but that is the point here – they have to maintain this image to survive so it is an all-encompassing job for them. They also have the keen ability to compartmentalize each and every source of supply to keep their lies where they belong – never shall any supply source meet another! Now as far as us, we are only supplemental players and the suppliers in their world and they need us to make it all work BUT there is never a real attachment to us or anything but fulfilling their needs. Their rigid and unyielding defense mechanisms can be seen as more or less defining their whole personality and everything else that seems like real emotions is purely manipulation to support that facade and draw supply into their delusional world. This is the only way for them to feel good about themselves and feel safe in a world that they have alienated and disassociated themselves from. They accomplish this by invalidating, devaluing, denigrating, and discarding others – sort of like a ritual to them just like they discarded their own self in favor of something better or the saintly façade in their case that they created. They have to feed the monster constantly to stay afloat so they can only focus on others flaws whether or not they really exist, rather than acknowledge, and come to terms with, their own deep flaws. They don’t have interpersonal boundaries whatsoever! I have heard this many times over and it rings true with Narcissists – ‘they can’t tell where they end and the other person begins.’ They view others as “extensions” of themselves, they regard them as existing primarily to serve their own needs, and they routinely put their needs before everyone else – even their own children and family. All people are regarded as Narcissistic supply or suppliers to keep the Narcissistic machine running. We only exist to cater to all of their personal desires. We are not regarded as an individual with needs, instead we each have an independent role that is designed around how they might use us to their own advantage. 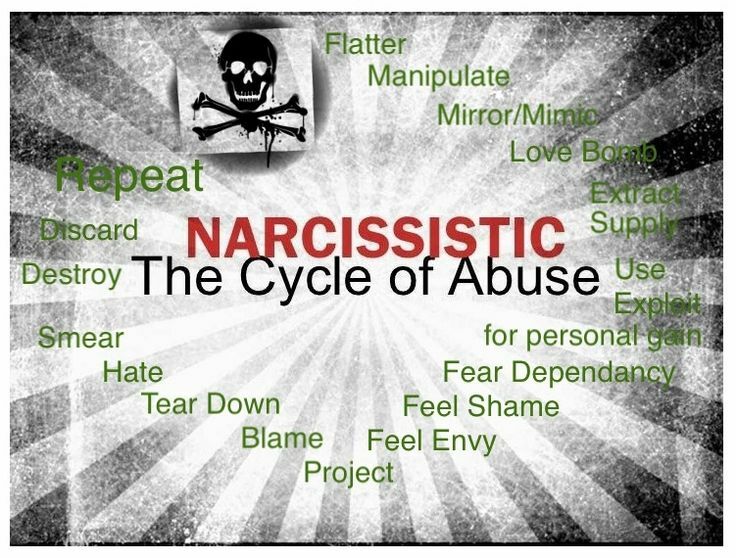 Whatever a Narcissist seeks out to give themselves, they generally expect to get it from others instead of earning it – this is just part of the self-entitlement dimension that defines them as the perpetual victim. They are basic extortionists! Just in their normal day to day conversations their flimsy or non-existent boundaries are so very apparent. Their undeveloped interpersonal skills and LACK of these boundaries compel them to dominate conversations, but somehow with charm and savvy that draw people to them. They seem powerful with their convictions and even very sure of themselves sharing intimate details about their life and even disclosing facts others would be more apt to withhold or be too embarrassed or humiliated to admit to. But they have no sense of shame, much less a filter or any restrictions to other people’s boundaries. But again there is no mechanism that registers right from wrong in their minds – that was deactivated when they gave up their real self – they truly are one huge void that is filled with LEARNED behaviors from observing us.